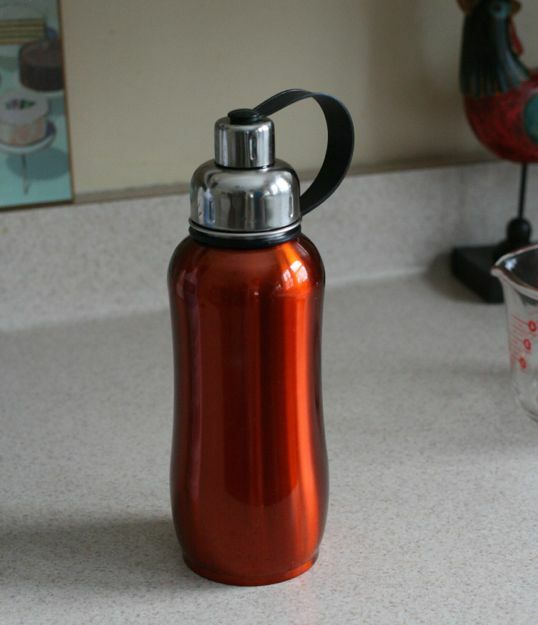 Mr. MVP has a stainless steel water bottle that will keep his water cold for up to eight hours, even in a sweltering hot car. 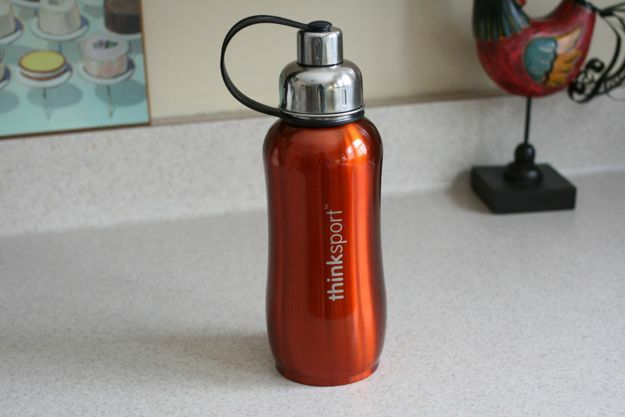 This water bottle is fantastic because it does not sweat on the outside and does not take on odors on the inside. 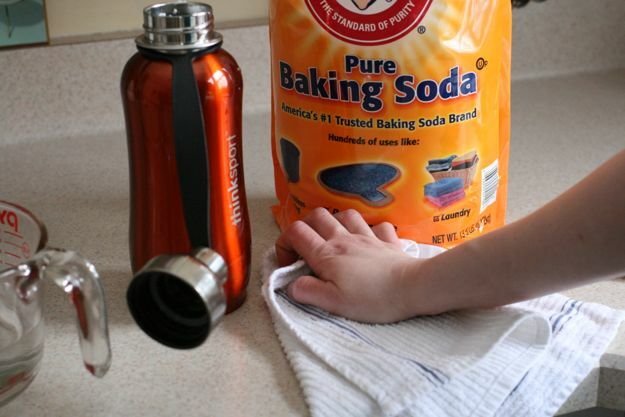 After five years of hand washing, however Mr. MVP started to notice a weird smell in the cap of his favorite bottle that simply would not go away, so I turned to my favorite cleaning team to get the job done: baking soda and water. 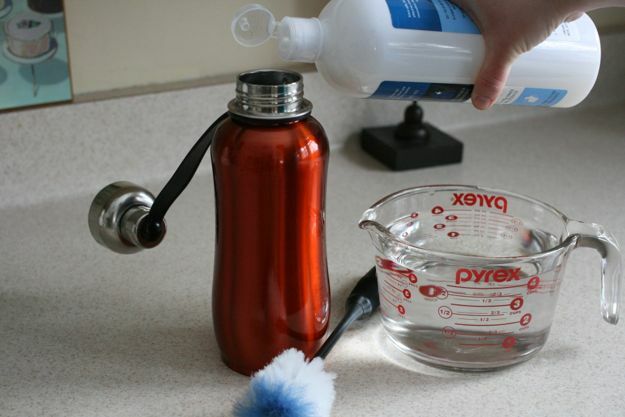 If you have a stainless steel vessel that is hanging on to coffee stains, weird smells or any odd colors, use this no fail overnight method to bring your favorite container back to life. Here is the offending bottle. 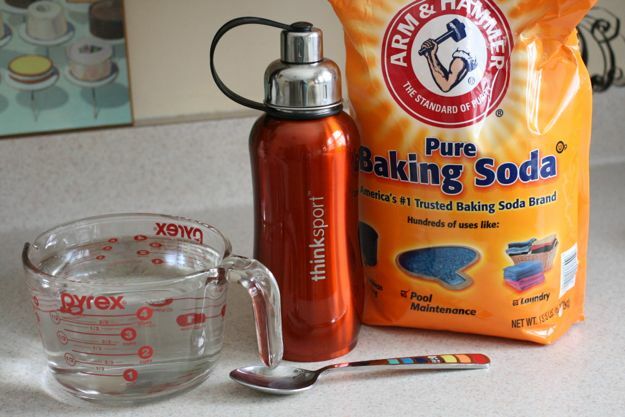 Your tools for this cleaning project are simple and include baking soda, boiling water and a large spoon. 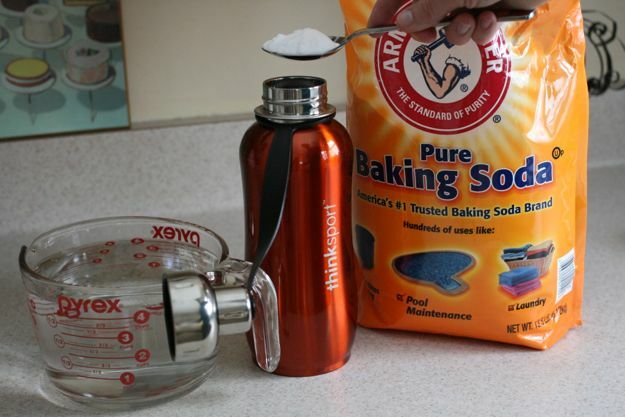 Carefully put one spoonful of baking soda in your stainless steel vessel.  This measurement is not exact. 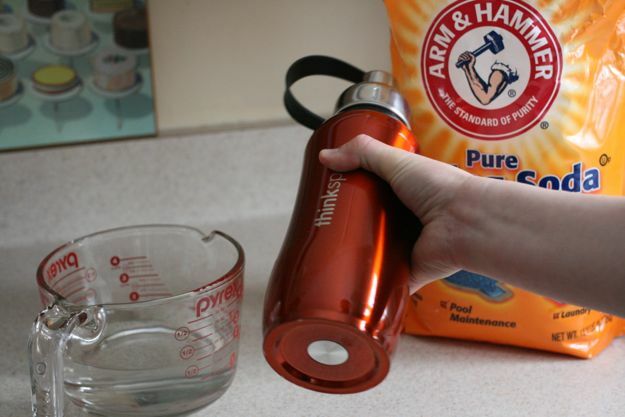 This is not a cake, it’s just a way to clean your favorite drinking bottle. Now add the very hot water. 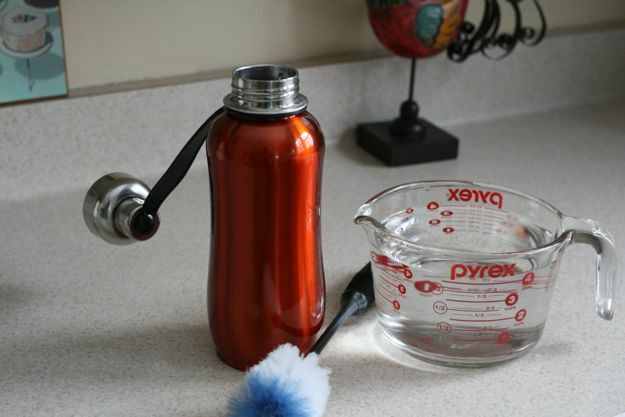 If you are like me, you will also need to clean up the water that spilled all over the counter and the floor. 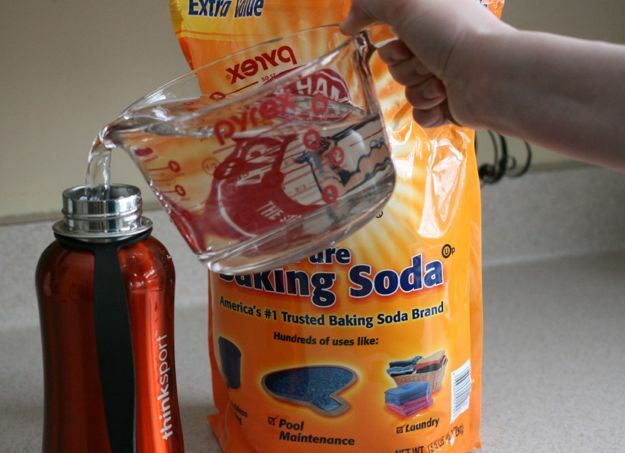 Once your vessel is filled with water there will still be baking soda on the lip, but don’t worry. Simply place the lid on and get ready to shake. Shake your container for one full minute. Think of it as cleaning and exercise all in one! 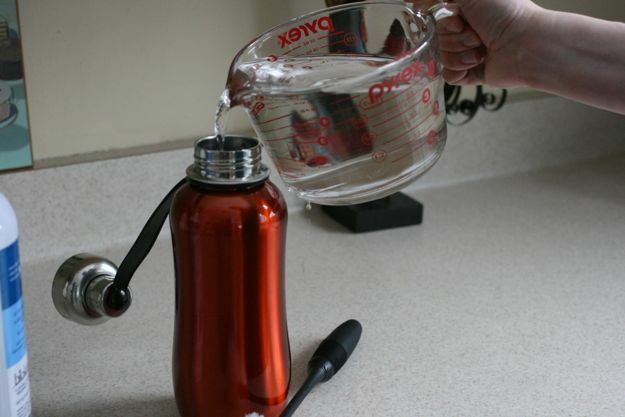 Now, put your vessel on the counter to rest overnight or for at least eight full hours. 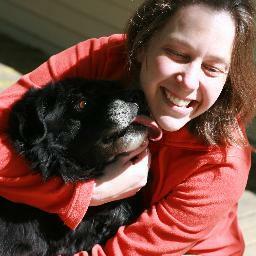 No peaking. After eight hours pour the dirty baking soda water out. 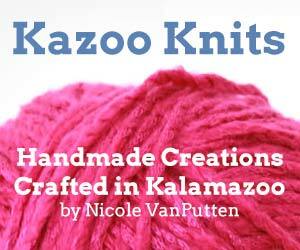 Grab your dishwashing soap, bottle brush (if you have one) and more very hot water. 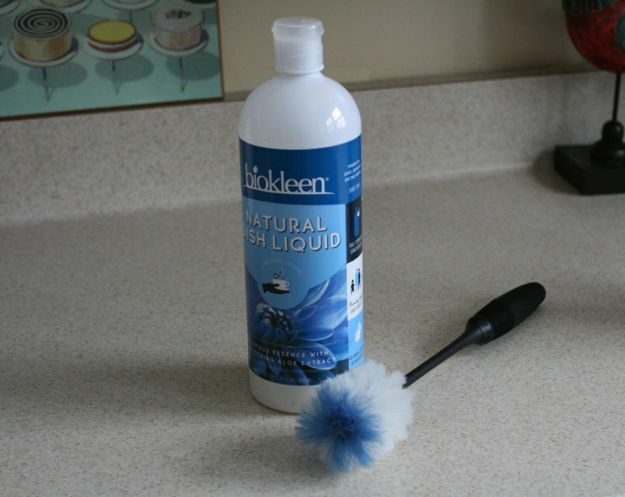 I like to use biokleen because it is chemical free and it doesn’t leave a residue behind. 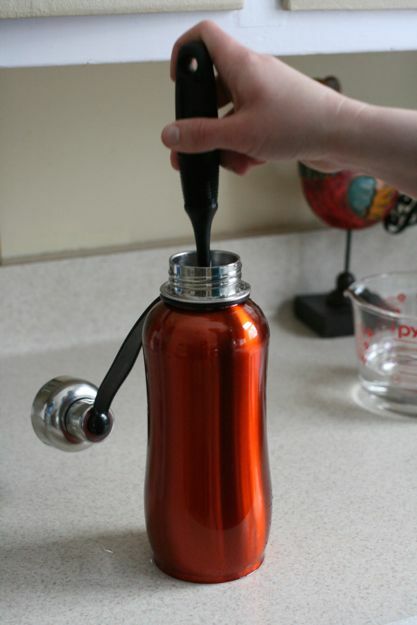 Fill the container back up with boiling water. The first step is to scrub the bottom and sides with the bottle brush and then put the lid on and shake the soap up and through the lid. 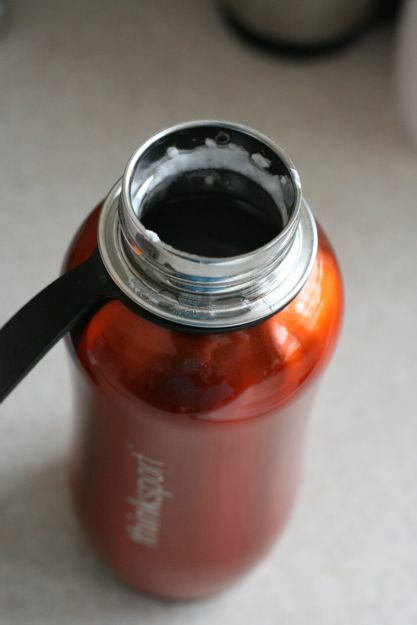 After rinsing the bottle with hot water the smell is completely gone and Mr. MVP’s bottle is like new again.